(APN) DECATUR — On May 14, 2014, the “Avondale” Four testified in the DeKalb County courthouse that they were not criminally trespassing when they refused to leave the Avondale Estate property after police served an eviction notice on August 09, 2013, but rather they were “standing their ground” against an illegal foreclosure and unlawful eviction. 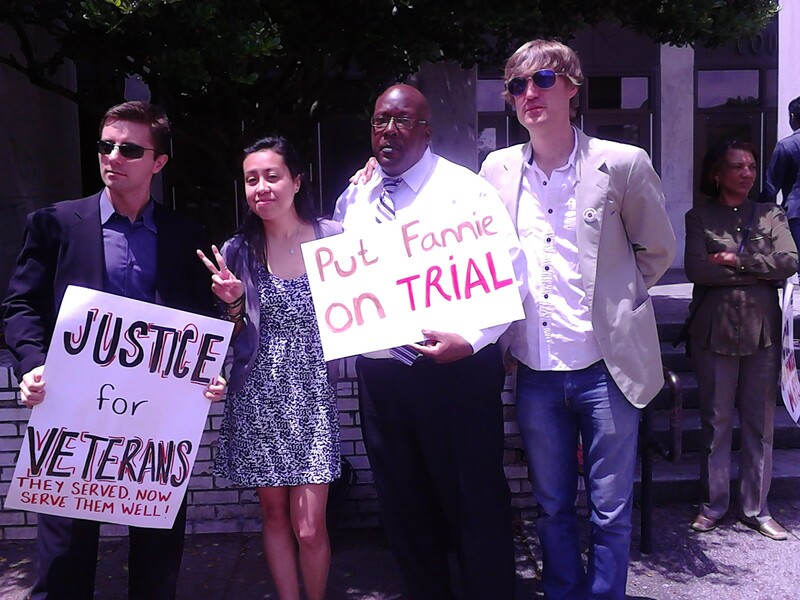 The Avondale Four are Mark Harris, the foreclosure victim; and three Occupy Our Homes Atlanta activists: Tim Franzen, Atlanta Economic Justice Program Director at American Friends Service Committee; Daniel Hanley, IBM software engineer and developer; and Mariam Asad, a PhD student at Georgia Tech. All four defendants believed they had the right to “stand their ground” with their bodies as a protest against an unlawful eviction. Generally, individuals have a right to self-defense or defense of others to defend the unlawful taking or destruction of one’s home. Further, they argue that Fannie Mae is a government entity and is one hundred percent in a federal conservatorship, and thus under the purview of the United States government. They believed they, therefore, had a right to be on the government-owned property that essentially is owned by the taxpayers who bailed out Fannie Mae. They also argue they have rights of freedom of assembly and freedom of speech, to protest an unlawful eviction on public property, under the First Amendment to the Constitution of the U.S..
“If people believe they are being thrown off their property illegally, the public policy matter designed in a code section… they should be allowed to resist with their bodies and not necessary engaging with physical altercation,” Attorney Mawuli Davis argued. “You understand this is a State court, I don’t deal with public policy… I leave that to the folks downtown… Do you have some cases you want me to look at in considering this motion for immunity because public policy is not my business,” Judge Dax Lopez replied. Judge Lopez summarized that Harris, after June 2012, had no agreement with Fannie Mae in writing, no forbearance, no injunctions, nor any orders to deem the eviction to be wrongful; and he said there was no evidence on record that Fannie Mae sought an eviction that was unlawful. “Immunity cannot stand in this case [with] no showing by the Defendants that the entry by the officers on August 09, 2013 was in fact unlawful… so those motions are denied,” Judge Lopez said. “We were aware we were raising something out of the box [Stand your Ground]. But in times like these we know we have to operate outside the box in order to look at their hand and cross-examine them. This is about what Fannie Mae is doing to this country and working-class people. We are not invested to win one case, we are invested to win the hearts and minds of more people,” Attorney Davis said after the hearing. This case is bigger than Mark Harris’s foreclosure. The Avondale Four are trying to put on trial Fannie Mae and other banks that received huge bailouts from taxpayers, and then turned around and used dual tracking, robo signing, and other questionable and illegal means to steal homes from hard working American citizens. The government did not prosecute criminal behavior by bank executives nor help bail out the homeowners who were often the victims of fraudulent foreclosures. “The court of public opinion works differently than the court of law, which we have found does not work particularly well to save people’s homes but does work well to take people’s homes.” Franzen said during the hearing. “The state has acted improperly in issuing a criminal trespass notice and arresting these folks when a party who gave the criminal trespass notice did not have the authority to do so,” Attorney Shawn McCullers told Atlanta Progressive News. “Deputy Marshall Picuo stated that he did not have the permission of Fannie Mae and he was not acting as their authorized representative and he was not the rightful occupant of that property,” McCullers said. “And therefore under the state law of Georgia, under the state statutes the only person who can issue a criminal trespass citation is a rightful owner, a rightful occupant, or a representative upon notification that they are duly authorized to act on behalf of the rightful owner or occupant; and Officer Picuo was neither of those,” McCullers said. “Peaceful demonstrations for political purposes is a well-established right that is one of the most fundamentally protected rights under the Constitution of the United States. If we are a country who claims to wrap ourselves in the Constitution, to live by the Constitution and live under the auspices of all men being created equal and free, then a government has a duty to rein in corporations, whether they be fictional corporations under the government or whether they be general corporations that are in the business of lending money for homes, in order that they do things justly and correctly. There was a 13 billion dollar settlement against J.P. Morgan [bank] recently with regard to wrongful foreclosure. How many bank executives went to jail? How many bank executives lost their homes?,” McCullers told APN. Katheryn Lasher, a representative of Fannie Mae, has been subpoenaed to testify at the next hearing on June 16 at 3:00 pm.